Veteran brand GUESS is heating up this summer by mixing style and music. A collaboration with international DJ and producer TIESTO on a limited edition watch is pretty mayor. The watch along with a 22 piece capsule collection will be available in GUESS stores and a few department and specialty stores. 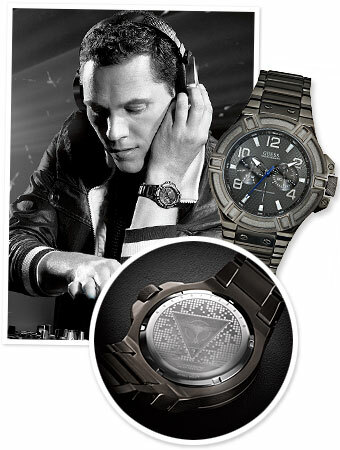 The TIESTO watch marries function and fashion embodying the characteristics of both GUESS and the major music maker. To create buzz, there will be a number of TIESTO performances in such cities as Dubai, Las Vegas, Paris and Sydney. For more details and too see if TIESTO is coming to a town near you, head to tiesto.guess.com. Can't make a TIESTO performance, GUESS still has you covered. 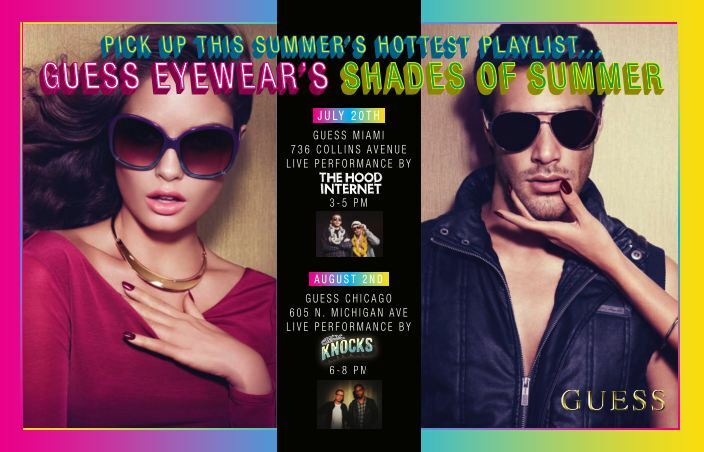 GUESS Eyewear has teamed up with Universal Music Group to launch their first ever Shades of Summer Playlist. The five song playlist includes songs by Penguin Prison and The Hood Internet to name a few. Available now until August 31st, the playlist can be downloaded with any purchase of GUESS Eyewear. To commemorate this cool collabo, GUESS is having a kick off party in Miami and Chicago with performance by The Hood Internet and The Knocks. The soundtrack of summer seems cool, having the right shades even better.